October 2018 – The use of trees in natural flood management is well documented and in order to find out more about trees and the tree planting schemes available to landowners, the IRT invited Ken Bucke from the Forest Service to speak at this event. This was the second event in the Trust’s exploration on the theme of natural flood management and Ken gave a thorough explanation of how trees are used in riparian situations and their increasing popularity in agri-schemes. Also present at the event was Mark Horton (Ballinderry Rivers Trust) who again demonstrated the River in a Box (EM River) model. And new to Inishowen, the Trust were delighted to unveil our new SuDS House model. This model demonstrated Sustainable Urban Drainage Systems and is an excellent tool for explaining how simple changes around the home can help with flooding, reducing run-off to downstream premises and helping to improve our water quality. This model was specially built for the IRT by the Trent Rivers Trust in the UK and is available for hire from the IRT. This event was an excellent opportunity to network with interested parties and there was a wide range of information on display. Many thanks to everyone who attended, thanks to the speakers and to the Colgan Hall staff. 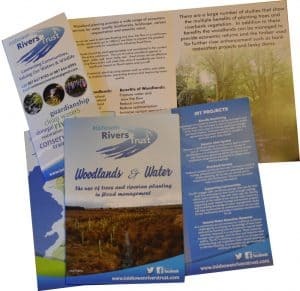 The IRT Woodlands & Water Leaflet (831KB) can be downloaded here. This event was supported by funding obtained through the Waters & Communities Office Community Water Development Fund 2018.